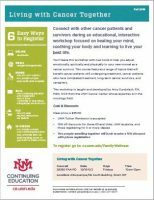 Connect with other cancer patients and survivors during an educational, interactive workshop focused on healing your mind, soothing your body and learning to live your best life. You’ll leave this workshop with new tools to help you adjust emotionally, spiritually and physically to your new normal as a cancer survivor. This course features a range of topics that will benefit cancer patients still undergoing treatment, cancer patients who have completed treatment, long-term cancer survivors, and caregivers. Please see the Living with Cancer Together Workshop flyer for information and feel free to share it with others! Cost: $85.00 Discounts Available. Registration required.